Wow, it’s the third Friday of Frocktober already. 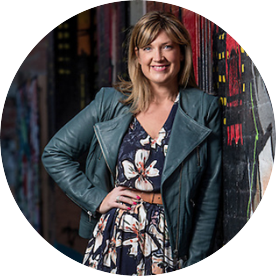 As I’ve mentioned previously, I’m participating in Frocktober this year to raise funds and awareness for the Ovarian Cancer Research Foundation (OCRF) by wearing a fabulous frock every Friday from some of my favourite smaller, boutique and/or local designers. (If you ‘d like more info or would like to support me, you can do so here). I’m sad to say that Frocktober has become more personal for me this week too, with a dear friend contacting me to tell me of her very recent ovarian cancer diagnosis. While I am shocked and still processing this horrible news, she made me smile when she told me that my frocktobering was very poignant for her and, “Girlfriend, I want to see you in your brightest, happiest frocks this month!”. But before I do, if you suspect anything is not quite right, please go to your GP post haste to get it checked out like my clever, beautiful friend did. I am so, so glad you did GF. And so on to this week’s frocks. 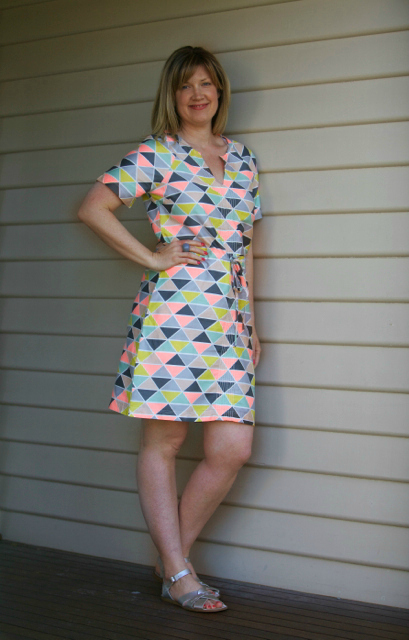 This week, I’m delighted to be bringing you a couple of fab frocks from Sunshine Coast label Heartfelt Designs. I first met Janet, who started the label a few years ago, last year after we “met” on Instagram (I was wearing one of her beautiful frocks when I was in Bali and tagged her). Our mutual love for colourful, relaxed frockery naturally drew us together. When Janet contacted me recently to show me her Summer 2015 look book, I was beside myself. So. Much. Gorgeous. As much as I love getting dressed up, the truth is that once the Christmas holidays begin, it’s all about casual comfort for me. That’s why I can never go past floaty cotton and linen frocks in bright prints that can be thrown over bathers with a pair of sandals or thongs. Janet knows this brief well (given her Sunshine Coast digs, it’s no surprise), and has come up with another stunning collection of pieces that are perfect for holidays, resorts or your local ‘hood. In a Heartfelt creation, you’ll be ready for your next pool side cocktail. Or trip to the supermarket. The Annika Dress in Red,* above, is made from 100% cotton voile. 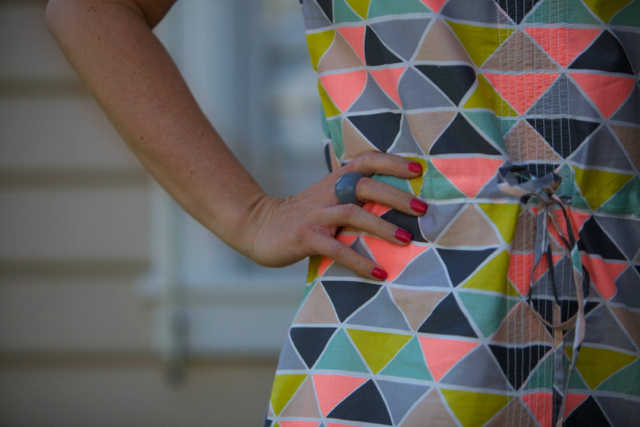 It’s light and easy to wear and is the sort of frock I reach for on hot Melbourne days. It’ll be coming with me to Bali in a couple of weeks too. While it’s a simple a-line shift cut, the shirring detail at the front bust line and the pretty contrast fabric trim at neck and hem elevate this frock to more interesting territory. I love the Indian block prints and the bright red/blue colour way too. It’s fresh, fun and pretty and perfect for every day wear. I’m wearing a size M and there is plenty of room which I prefer in hot weather. It hits me an inch or so above the knee too and I’m 5’9″. 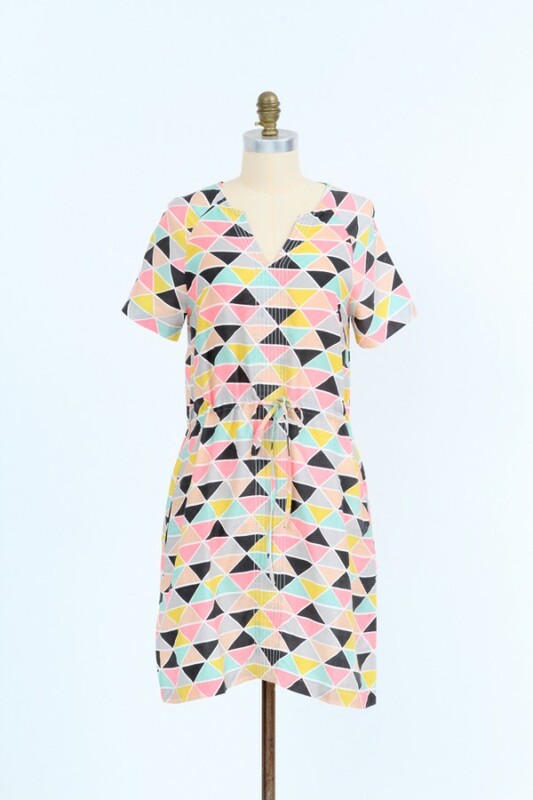 The second frock is the Lily Dress* with it’s fun geo print. I was immediately drawn to this fab print with it’s gorgeous neon highlights and interesting colour palette. The colours in the print in real life though are a bit different to those on the website. The pink is actually more of a neon coral, which I love anyway so it was all good for me. This fun dress is made from 100% cotton sateen and has a slightly heavier weight compared with the Annika dress above – it’s still light but more substantial. It’s a quality cotton that feels nice to the touch. While it’s a relatively straight shift style cut, the drawstring waist not only adds shape but some interest too. The other details, like the notch neckline and top stitching down the centre front are typical of Heartfelt. Janet always finds a way to inject lovely details into every day dresses, making them feel a little bit special. Size wise, I’m wearing a Large as it’s a straighter fit. It’s a comfortable fit without being oversized. Length wise, it’s a fraction shorter than the Annika dress above. Looking for a bargain? 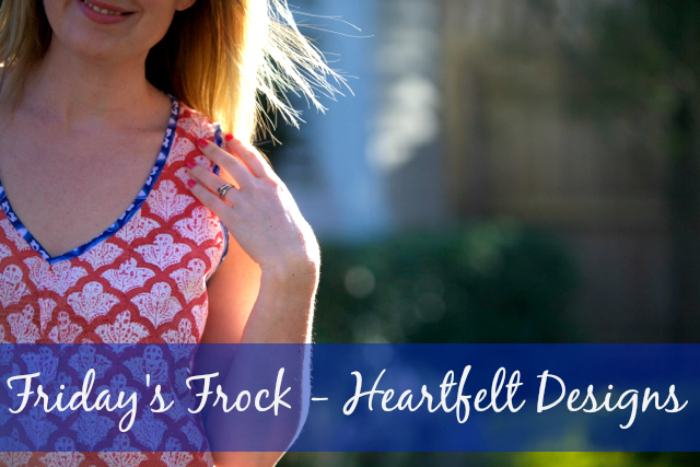 It’s well worth checking out the sale section in the Heartfelt Designs online store too – I wore several of these pieces last Summer (and loved them). To see them on me (and for sizing information) head here and here. * These dresses were gifted to me in accordance with my Disclosure policy which you can check out here. Are you a fan of Heartfelt and of either of these frocks? What are you looking for in a casual every day summer frock?